In my previous post, I mentioned that Harbin has quite a bit of Russian influence. 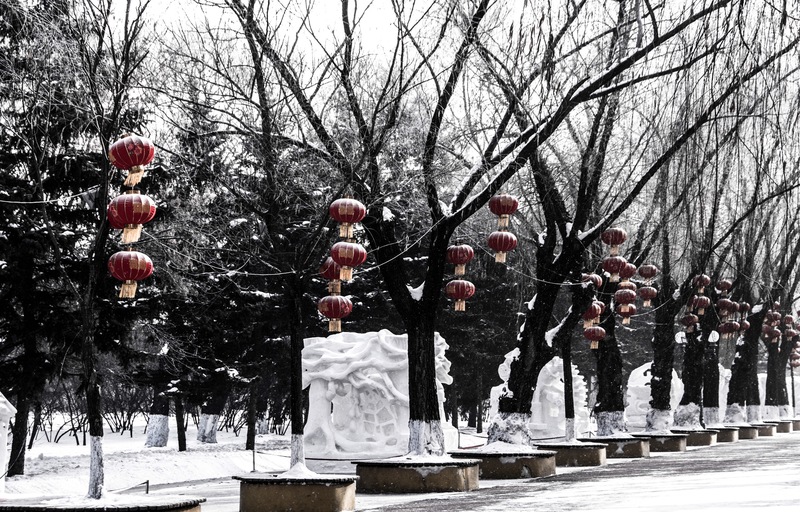 In 1898, the region became inhabited by a large Russian population due to the construction of the Chinese Eastern Railway (an extension of the Trans-Siberian Railway) and also became the more modern city that we know today. Around the city, remnants of the Russian architecture and influence still remain. It makes it a very interesting and different city than others I have seen in China. Well enough about history, let’s get back to the fun stuff! 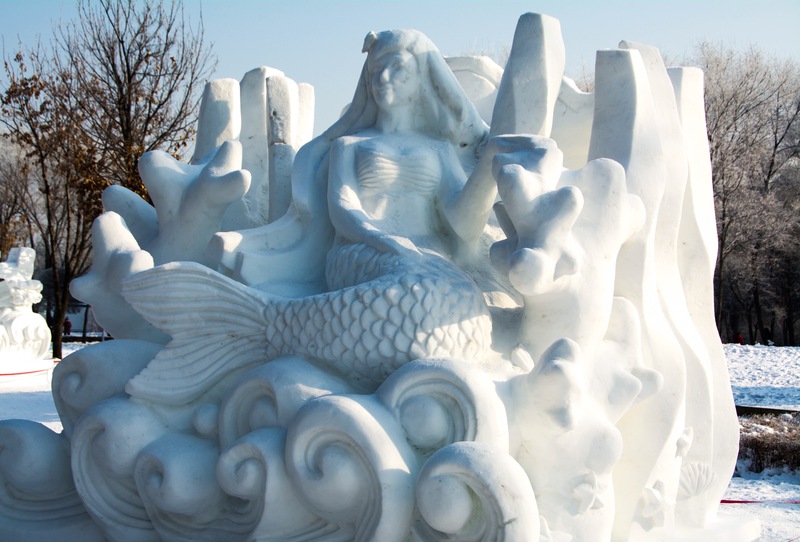 The Sun Island International Snow Sculpture Expo is not very far from city center. 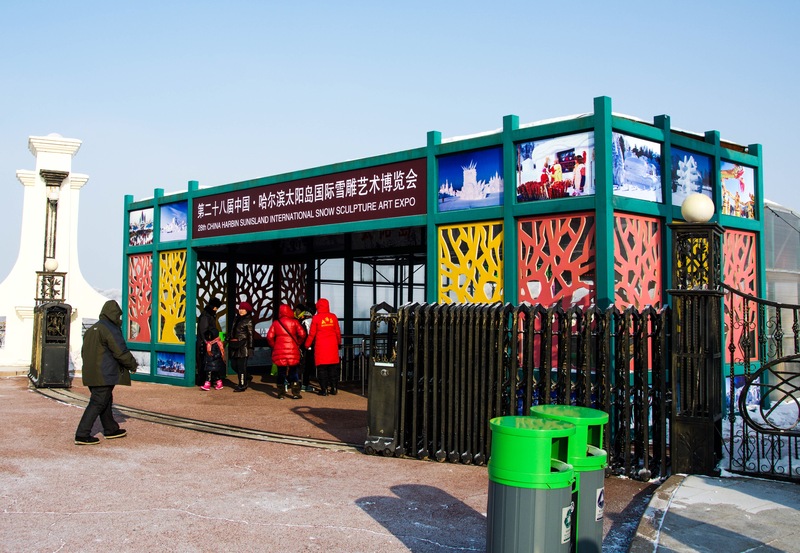 Tickets for the Expo are 240 RMB and the area is quite large, so definitely be prepared to walk and make sure you are all bundled up! 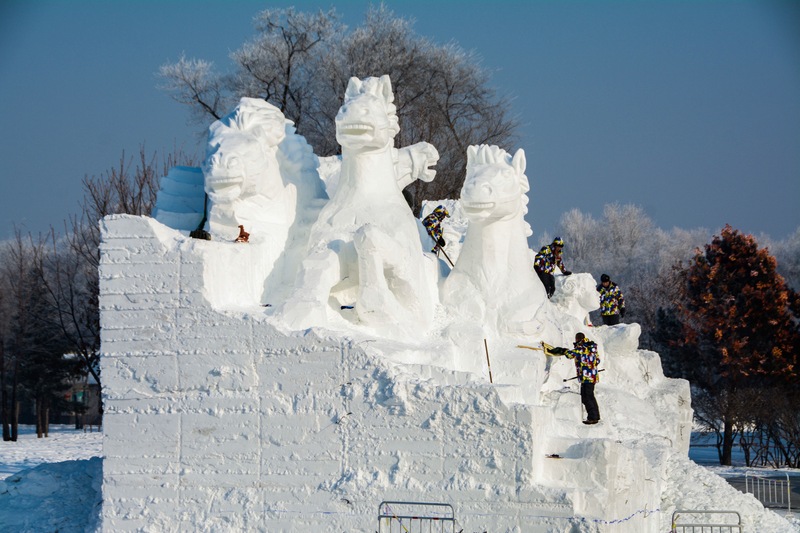 Since we arrived before the official opening of the Expo, some of the snow sculptures were still in progress. Here are some of the sculptors working. First they pack the snow into bins to make them into blocks of snow. Then they stack the blocks until they get the proper size, then the sculptors climb on top and start working their magic. The sculptors even draw some guidelines to help them with the design. I can’t imagine being outside all day working on these enormous works of art. So here are some of our favorites from the Expo. An Alligator protecting its newly hatched baby from a Cobra! Such a good mother! The Little Mermaid, okay not really but look at the detail of the scales on the Mermaid’s tail! During your walk you may get a little too cold, but have no fear there are little cafes that you can stop in for a little hot milk tea or coffee and enjoy a little warmth. Trust me you’ll need it. And when they tell you to pay 40 RMB per beverage, you will gladly hand over the money (I would post a picture, but we forgot to take one for you because we were fully focused on warming up….I know, I know so selfish). 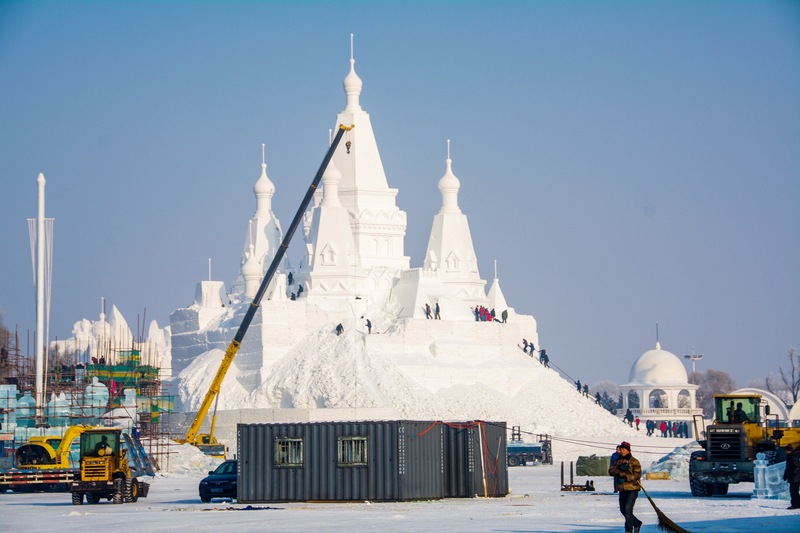 The Snow and Ice city portion of the Expo was still under construction, but just look at these amazing structures already erected. You can see how large these snow buildings are. 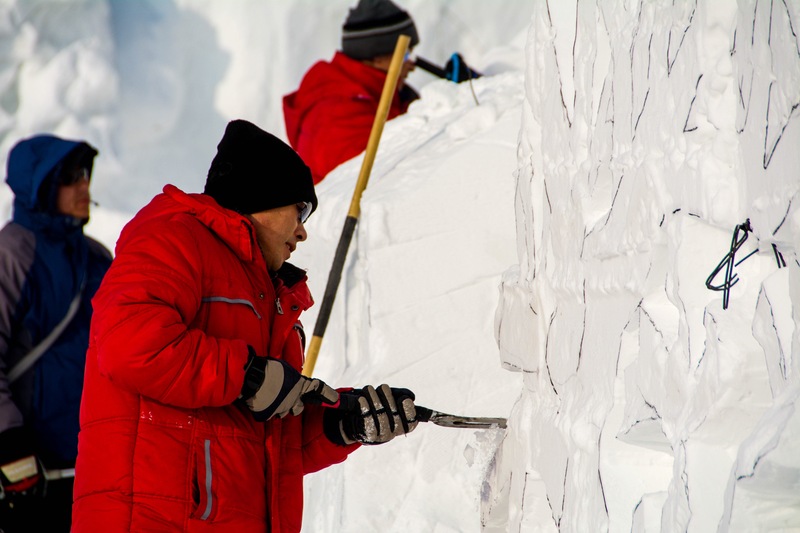 And the size of this Snow wall! It is truly amazing. 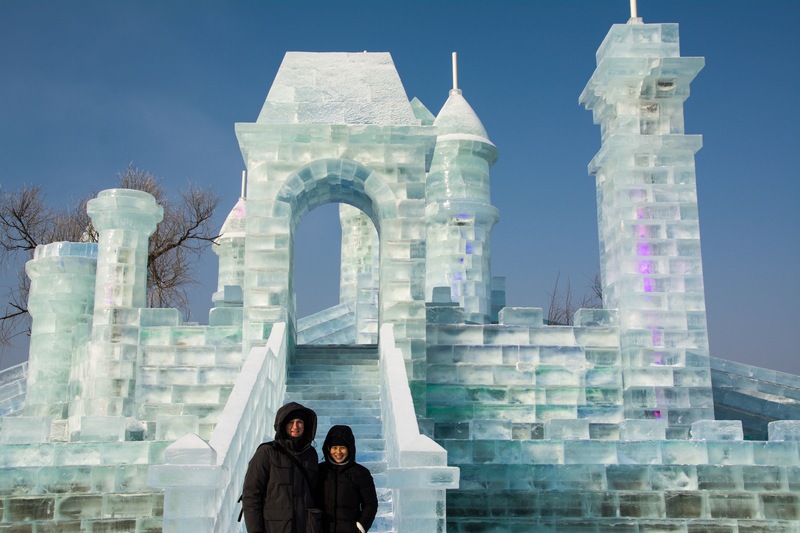 Here is just a small taste of the Ice buildings. You’ll see more of these at the Snow and Ice World. 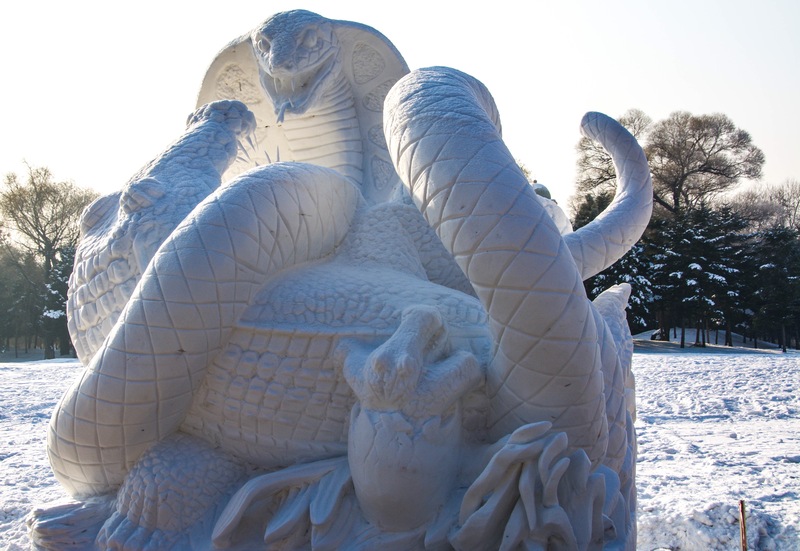 Even with the hefty price tag to gain entrance to Sun Island, I definitely would recommend going and seeing all of the spectacular things that you can do with snow. Next time it snows you might be inspired to make your own version at home! During our trip we also got to try a meal served out of an iron pot which is a traditional Northern Chinese way of cooking. Since they often had large families and of course it was cold, they had a large iron pot that was over the fire and everyone could sit around and eat. There are many restaurants in Harbin that serve this with fresh fish, but beware that they will try and upsell you and make you buy some really exorbitantly priced fish. Go ahead and choose one of the cheaper fishes (and don’t let them cut more fish than you ask for), and your meal will still be fresh and tasty. You’re really there for the flavor of the spicy soup and you can load up on the tofu, veggies, and noodles. Definitely don’t forget the corn cakes, they are awesome and cooked on the side of the iron pot, so the bottom is crispy and the top is fluffy. Here is a video of them cooking our meal, it was pretty darn yummy and was perfect to warm us up after being outside.